A weird family affair�featuring switched identities, extortion, and $2 million�leads to a murder that even has Perry confused. Don Anderson as a Courtroom spectator. Director of Photography � Robert G. Hager, A.S.C. Film Editor � Richard H. Cahoon, A.C.E. Sound Effects Editor � Gene Eliot, M.P.S.E. Sightings: A few favorite frequent faces show up in the courtroom gallery today: �Miss Carmody,� back row, prosecutor�s side; Little Old Lady #1, far corner, prosecutor's side; Distinguished Gentleman #1 near the Lady; and Quiet Old Man #1, in front of �Carmody� and near the Gentleman. The Little Old Lady has on a different hat today, too�much darker than usual. Read more about them all here. Submitted by gracep, 11/17/2010. Uncredited Actors: Don Anderson joins our court as a spectator as Glamis is called to the stand. Bill767, 1/6/16. Anomaly: Although only listed as �Autopsy Surgeon,� Michael Fox is, once again, Dr. Hoxie. Even Burger addresses him as such. Submitted by gracep, 11/17/2010. ++ When Perry's visiting Carter Gillman in jail, Perry has a lighted cigarette in his hand. The camera then moves to show a view of the back of Perry's head and right shoulder. In this view, Perry apparently blows cigarette smoke which rises above his head, but when the camera moves again in front of Perry, the cigarette is in his hand resting on the table. jfh 04Oct2018. The Curious Coffee Set makes two appearances in this episode. First in the opening scene and later in Perry�s office. Submitted via email from Evelyn, posted by daveb, 7/24/2011. CARS. Perry and Paul both get new cars. Paul's last cruise in his '60 TBird was Ep#114 while Perry last drove his '60 Sunliner in Ep#118. (1) Paul's NEW 1961 Thunderbird Convertible, black, top down, Licence# probably VPE 295 (possibly "UPE"). In Ep#128 Paul's plate# is VNE 547. (2) Perry's NEW 1961 Ford Galaxie Sunliner convertible, Lic VNE 545, black, top down. Note that this is a Sun (not Sky) -liner! Sunliner was soft-top; Perry's 1957-59 Skyliners were "retractable hardtops" (discontinued post-1959). (3) Glamis Barlow's 1954-57 Jaguar XK140 DHC, med color, top down. DHC=�Drop Head Coupe�=�convertible�. This is the first appearance of a Jaguar car in the series. More on this & other Jaguars in Comments section below. A '61 TBird was Pace Car at the Golden Anniversary Indy 500 (30 May 1961), ten days after this episode aired. Added by Gary Woloski, 11/23/12. FAULT Fun though it is to squeeze Tragg into a scene, it makes little sense that he would be serving a subpoena: Courts - at least at the level we see in PM - are a county function...the logical server would be someone from the sheriff's office. Nitpicked by Notcom, 122616. This is one bizarre episode in that we never see the victim, nor do we meet one of the prime suspects. Posted by Kenmore, 12/14/2009. Fans of early TV will recognize Walter Kinsella as Happy McMann, proprietor of the tobacco shop frequented by Martin Kane, Private Eye. Submitted by francis, 4/19/12. 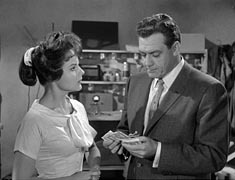 Although he's frequently offered or handed beverages, this is one of the very few times Mason is seen actually drinking one; in this episode he enjoys a highball with Della. Submitted by francis, 4/19/12. + Ditto for Perry smoking cigarettes: we sometimes see Perry lighting or stubbing out a cigarette, and often holding one, but we actually see him smoking in this episode (although, see Anomaly). jfh 04Oct2018. Glamis' JAGUAR. Identifying where in the JAGUAR family Glamis' car lies is a lot easier than figuring out the family connections in this PM episode! Some visible Identification Points that distinguish her XK140 (1954-57) from an XK120 (1948-54) or an XK150 (1957-61) are: 140 has split two-piece windshield (like 120 but unlike 150); 140 has one-piece front bumper with two large over-riders (like 150 but unlike 120); front JAGUAR badge is integral with grill (120's is separate and above grill); 140 has a deep �crouch� in the body side sculpting, forward of rear wheel (like 120 but unlike 150); and exterior door handle position. Note the increasingly modern appearance from XK120 to XK140 to XK150, culminating with a leap into the Space Age with the E-Type or XKE in 1961. The XKE debuted at the 1961 Geneva Motor Show, 16-26 March 1961 - at about the same time that this episode #121 would have been filmed! There was no JAGUAR XK130 (unlucky 13??). Both an XK150 FHC and an XK140 DHC will appear in Episode #133. Added by Gary Woloski, 11/24/12. Paul's convertibles sure are snazzy, but it seems strange he would sit in a convertible, with the top down, in plain sight of everyone, while conducting an undercover operation (in this episode, staking out the Gilman house). Submitted by 65tosspowertrap, 10/3/2013. Willis Bouchey really chews up the scenery in this episode as the Judge. He looks and sounds like he should be on the Supreme Court! He is my favorite Perry Mason judge. Submitted by 65tosspwertrap, 10/3/2013. Don Dubbins' character, Hartley Elliot, says "I refuse to answer" repeatedly on the witness stand. In episode 168, TCOT Prankish Professor, once again his character says "I refuse to answer" on the witness stand. Submitted by 65tosspowertrap, 11/9/2013. You just know that when an episode has characters named Glamis(!) Barlow, Hartley Elliott, and Cartman Jasper--as opposed to the more reasonable Elliott Hartley and Jasper Cartman--there's a good chance the episode is adapted from an ESG novel. (See Episode #241, TCOT Mischievous Doll, for another example of the misnamed members of the Jasper family.) Submitted by BobH, 2 July 2018. Indeed, as noted above, not only do we never see (1) the victim, Vera Martell, but we also do not see many of the other people involved in the convoluted plot: (2) Stephen Barlow, (3) Phyllis Monroe, (4) G.W. Monroe, and (5) Joe Yemen (who might possibly have changed his name to G.W. Monroe). And poor Muriell has little to do, other than to provide one more duplicate daughter. Submitted by Fifty-Niner on 11 August 2011. And, adding to the bizarreness mentioned above, the shot of the revealed killer's grasping, clutching hands. They seem to float, disembodied in space against a black background - wonder if they actually belonged to the actor who played that role? Submitted by MikeReese, 11/22/2013.